To be able to explain the contents of the product more. This review is about item#08583836. The position of the screw hole for relay mounting did not match, but we have installed it as new and used without problems. This review is about item#09254253. It can be used without problems by changing from other manufacturers. There is no problem exchanging from Yaskawa Electric made. This review is about item#09254244. This review is about item#47839145. The correspondence was quick, the item arrived quickly. The breakdown of the electric parts is a lot of time and it is very helpful. This review is about item#08583766. Since the motor was changed from 0.1 kw to 0.2 kw, the thermal relay was changed to the proper one. Since the motor was changed from 0.1 kw to 0.2 kw, the thermal relay was changed to the proper one. As it was instant delivery, I was able to replace it immediately. Especially used without problems. This review is about item#08583723. It was cheaper than the dealer's purchase and the delivery was quick. This review is about item#08583793. Since rust appeared in the magnet switch, it was exchanged at the same time when it was exchanged. 1, because there was no content that became a problem because I ordered by looking at the same manufacturer + model number as the replacement item to be replaced. 2, Since there was a big difference between fixed price and purchase price, there was also anxiety, but it is a familiar domestic manufacturer item and purchased. 3, It is useful for procuring because there are no electric materials and water supply members nearby. This review is about item#08583696. I used it as a set with an electromagnetic contactor for an air compressor. 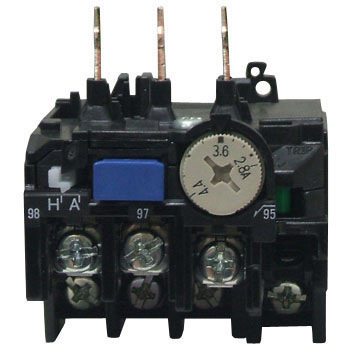 Mitsubishi Electric's open type electromagnetic switch (order code 08582533) that I purchased this time was published as a representative image with Thermal Relay this time. However, the answer to the inquiry was an e-mail with "Thermal relay optional". Therefore, as a result of ordering separately, things of the posted photo were sent and I was allowed to return only the relay. Regardless of the accuracy and completeness of the product we are pleased to be able to use it without any problems, but I would like to ask a reliable answer about product knowledge. Regarding other countermeasures, it is quick, reliable and hard to beat.